Serenity Cottage - Great location, quiet neighborhood. 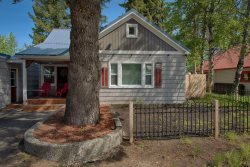 Close proximity to Payette River and Rails to Trails recreation. Deep drive, private setting. Garage access. Large deck with wooded view. Gas grill. Bright, southwest exposure. Comfy furnishings. Open floor plan. Fully equipped kitchen has nice work space and lighting. Keep the cook company. Counter seating too. Loft has cozy reading space and a lovely view of the trees. Let the sunshine in - Dining and living area has deck access. Spacious master bedroom with queen bed. Guest bathroom 1 has hall access. Guest bathroom 1 with full size laundry. Upper to lower stair well. Bright loft space with forest view. Cozy reading nook. Upper level has loft, guest bath and two bedrooms. Guest bedroom 2. Guest bedroom 2 has Twin over full bunk set and a twin fold out couch sleeper. Upstairs, guest bathroom 2. Lower level has guest bedroom 3 with a Queen bed. Gather around the game table. Downstairs lounge has futon to accommodate two more guests. Downstairs lounge has nice lighting and access to lower patio. Nice, deep driveway for your toys. Covered breezeway keeps you out of the weather. Extra deep garage for your cars and toys. At the end of a recessed drive and wall of pines you’ll find the floor to ceiling mountain ambience of the Serenity Cottage. Accommodate up to 12 guests in this 4-bedroom, two-bath country charmer, located just minutes from Payette River and Lake access; and adjacent to the cycling and skiing Rails and Trails system. The Activity Barn is less than a mile away and downhill enthusiasts are only 25 minutes from the Brundage Mtn. lifts. This bright living space with southern exposure is beautifully enhanced with hickory wood flooring and cabinetry. Access the west facing prow deck via the dining or living rooms. A well equipped kitchen has unique and comfortable cork flooring, plenty of counter space for meal prep and an open living design. Gather friends and family in the dedicated dining area and keep the conversation going in the adjacent great room where you are sure to witness a daily visit from the local forest wildlife. The main level has the Master Bedroom with a hall access, combo bath and laundry room. You’ll find two bedrooms and a full size bathroom on the upper floor and a loft space with a tree top view where you’ll find a cozy nook to curl up in. The fully finished basement has a sleeping room with a queen sized bed and a TV lounge with a futon, comfy seating, game table and sliding door access to the great outdoors. Keep yourself and your vehicles out of the weather via the attached, extra long garage and covered breezeway to this lovely home. Called in a week before arrival to secure my Labrador could join us, quick and easy upgrade. We rented a very nice, clean, and comfortable cabin that was accurately described. wish the wifi was a little faster but great stay thank you!